This is the most common form of skin cancer. Basal cells reside in the deepest layer of the epidermis, along with hair follicles and sweat ducts. When a person is overexposed to UVB radiation, it damages the body's natural repair system, which causes basal cell carcinomas to grow. These tend to be slow-growing tumors and rarely metastasize (spread). What Kinds of Skin Changes Should I Look For? **If any of these conditions occur, please make an appointment to see one of our dermatologists right away. The doctor may do a biopsy of the mole to determine if it is or isn't cancerous. 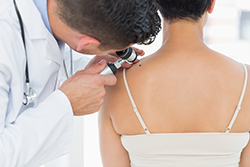 If you are concerned about your risk for skin cancer and need a skin examination, call our Rockville, MD office today at (240) 246-7417 to schedule your next dermatology appointment!